John Muir once called a redwood grove his cathedral. Similar in vein, De Groene Kathedraal (translated as the Green Cathedral) is an organic copy of the famed Notre Dame, and is very much in the spirit of the great naturalist. By accident, A Daily Dose of Architecture came across the living building on Google Maps, and found that this Dutch cathedral had been grown rather than built in southern Flevoland, Netherlands. Planted by artist Marinus Boezem in 1987, the cathedral consists of 178 Lombardy poplar trees that form the walls of the cathedral, with pathways mirroring the arches of the Cathedral of Notre-Dame, Reims, France. 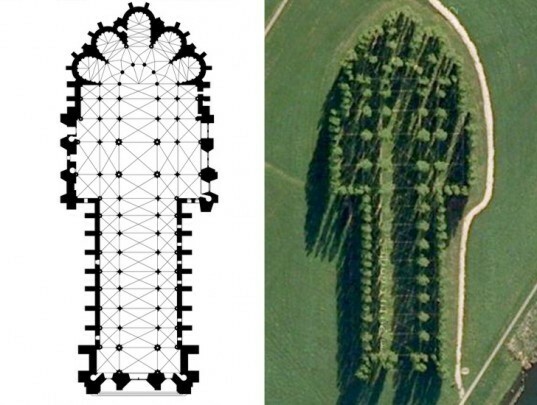 The poplars grew to approximately 30 meters in height, the same as the Reims Cathedral, and are placed where the columns and buttresses of the original building sit. The concrete paths cross to create a web in the middle of the grounds that correspond to the elegant double barrel vaults, giving the installation a more formal feeling. 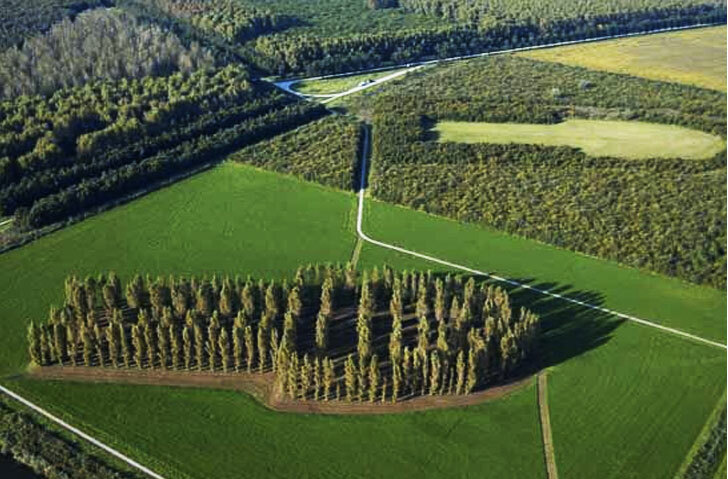 The installation is 150 meters long and 75 meters wide, and was opened to the public in 1997 when the trees matured. Because the trees will continue to grow and eventually die, Boezem has already begun planting a new cathedral adjacent to the existing installation. The new cathedral is again created naturally, but this time trees are grown as a negative of the first Green Cathedral. The works are a subtle twist on the idea of eternity, where the lessons of spiritual awakening are reflected in the process of growth and decay and a cerebration of the natural world. I would like to have seen this done with larger spreading trees, like oaks, so that the canopy would have filled over with large branching arches.